PLEASE NOTE: Federal & state law as well as the Joint Commission mandate that Baystate Health provides trained medical interpreters to patients with limited or no fluency in English. Use of educational tools is for relationship-building purposes only. Patient Education materials in 15 languages, accessible any Baystate Health location. DeafHealth showcases people using ASL to talk about medical issues. Radio Lingua Network offers many Coffee Break podcasts. LiveMocha connects users with lessons and learning communities. Learning to communicate with people in a second language is a thrilling experience. Please keep in mind that you must study for years to become sufficiently fluent to interact with patients or their family members in your non-native language in a medical setting. 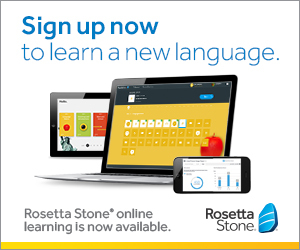 Sign up to use Rosetta Stone in the Cloud. Language learning in 24 languages through Rosetta Stone's e-learning option. Sign up for access with this REQUEST FORM. The program has three components, RS Course, RS Studio and RS World, and uses special features such as intelligent sequencing, actionable feedback, and speech activation using speech recognition technology. PLEASE NOTE: Federal and state law as well as the Joint Commission mandate that Baystate Health provides trained medical interpreters to patients with limited or no fluency in English. Use of these educational tools is for relationship-building purposes only. Borrow Pimsleur Spanish(Latin American) audio CDs and mp3s. The Baystate Health Sciences Library is located on the ground floor of the Chestnut Building. We are open Mon-Fri from 7:00am-5:00pm. We use your work badge as a library card. For more information, call 4-1865 or email library@baystatehealth.org.